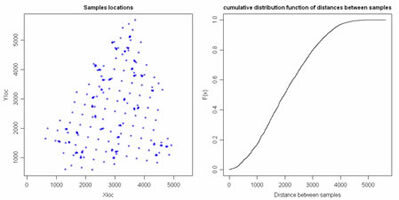 Compute distances between all pairs of samples and plot distances in a cumulative histogram. Compute Voronoi polygons and compute declustered basic statistics. 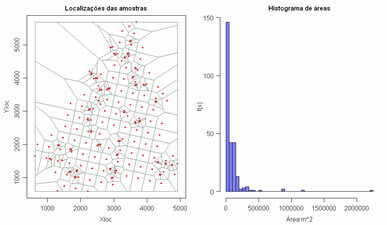 An histogram of the Voronoi polygon areas are displayed at right. Overlap a set of samples with a mesh of cells and compute average values of several variables within each cell. After, compute global declustered basic statistics. 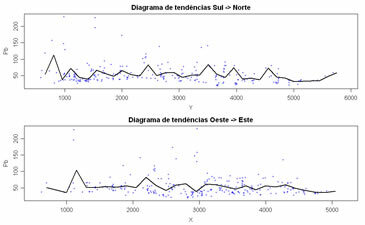 Perform a trend analysis of a quantitative variable along X and Y directions.